1. An acknowledgement and agreement from the Customer that the Customer is lawfully able to enter into a binding contractual commitment with Company and all information provided by the Customer is true, accurate and complete and will be maintained as such through the term of use of the Solutions. 2. An acknowledgement and agreement from the Customer that the provision of the Solutions, as white-labelled for Company, may be suspended and/or terminated in the event the Customer does not comply with the EULA Requirements. 3. An acknowledgement and agreement from the Customer that, as between the Customer and the Company, the Solutions and all intellectual property rights therein, including patent, copyright, and trademark rights, are the sole and exclusive property of Company and/or its technology partners. j. That no bulk emails may be sent using the Solutions, except in compliance with applicable Third Party Service Terms set forth at Exhibit 4 below and all applicable law. 5. 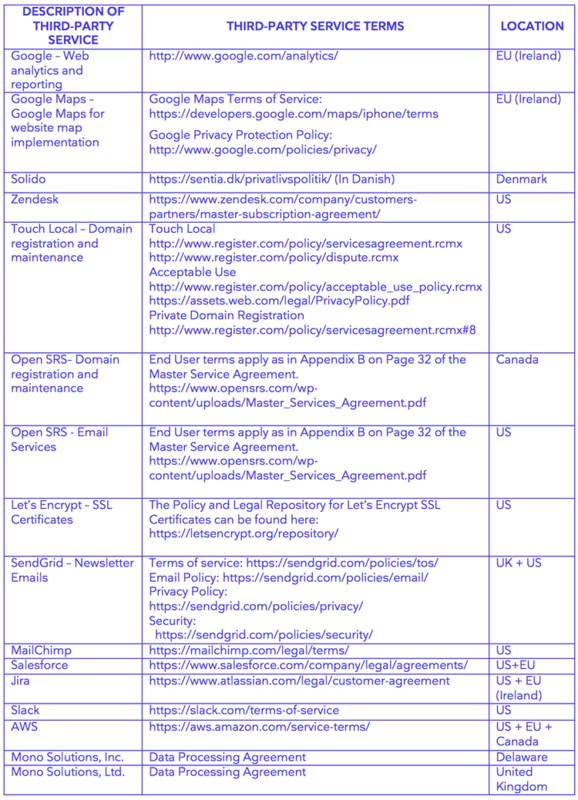 An acknowledgement and agreement from the Customer to comply with all Third Party Service Terms required by providers of Third Party Services prior to the use of such applicable Third Party Service, as set forth on Exhibit 4, subject to such updates thereto as Company and/or its technology partners, including Third Party Service providers, deem necessary or appropriate. 6. An acknowledgement and agreement from the Customer that there is no warranty with respect to the Solutions and/or the Customer sites derived from the use thereof and all implied warranties are disclaimed in their entirety to the fullest extent allowable under applicable law. 7. An acknowledgement and agreement from the Customer that it is responsible for and will indemnify Company and its technology partners for any violation by Customer or its Internet users of the EULA Requirements. 8. An acknowledgement and agreement from the Customer that the Customer: (i) is solely responsible for ensuring that the configuration of the Customer website created utilizing the Solutions, including graphical elements of text, color, video and interactive features, is compliant with all guidelines, industry standards, and other non-governmental and/or quasi-governmental standards, including without limitation, the Web Content Accessibility Guidelines (WCAG) 2.0; and (ii) shall hold harmless Company and Company’s technology partners from and against any claims arising from a failure to comply with the foregoing.